Today night is First Wednesday Bachata at Copacabana Salsa Night! 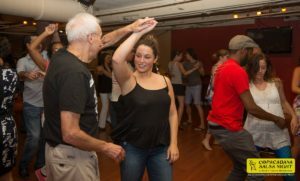 You know what that means – Bachata lesson at 6:45 followed by the weekly salsa lesson at 7:45. No experience necessary. No partner required. Free dancing til close at 11pm and no cover. 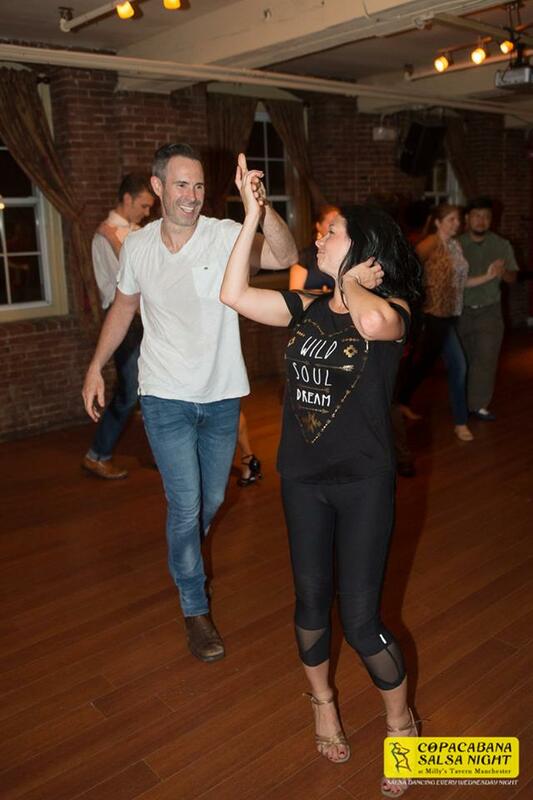 Come dance the night away in a fun welcoming community. 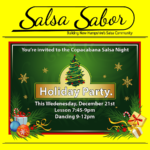 Salsa Dancing tonight at Copacabana Salsa Wednesdays! Come have fun dancing the night away to the best mix of Salsa and Bachata. 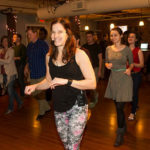 Learn to dance with lessons at 7:45 for just $5. Special performances by local area teams tonight. Come out to cheer fellow dancers on as the perform after lots of hard work learning and perfecting these fun numbers! Come learn to dance salsa, or social dance the night away at Copacabana Salsa Wednesdays. 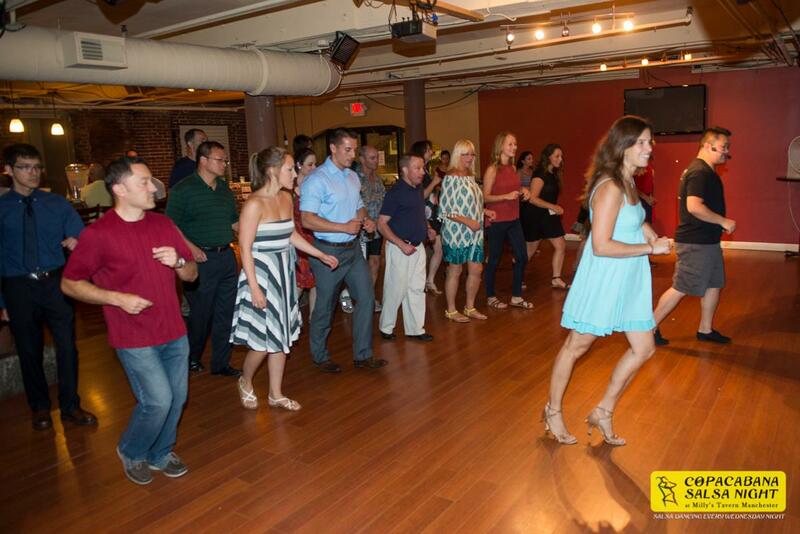 Every Week we host the best, most fun night of dancing in New Hampshire. 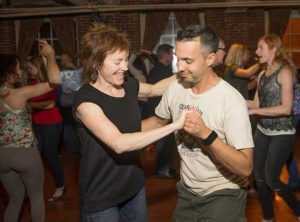 Salsa lessons start at 7:45pm and cost just $5. No experience necessary. No partner required. Social dancing starts after the lesson at about 9pm and runs till close at 11pm. Never a cover charge at Copacabana Salsa Night. 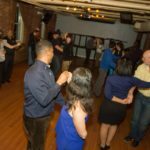 Come have fun, meet great new people, and dance the night away to the best mix of Salsa and Bachata with a dash of ChaChaCha! 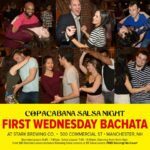 First Wednesday Bachata at Copacabana Salsa Tonight! 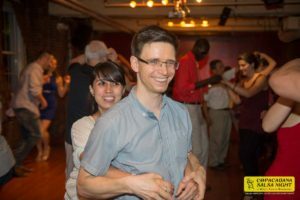 It is First Wednesday Bachata at Copacabana Salsa tonight! 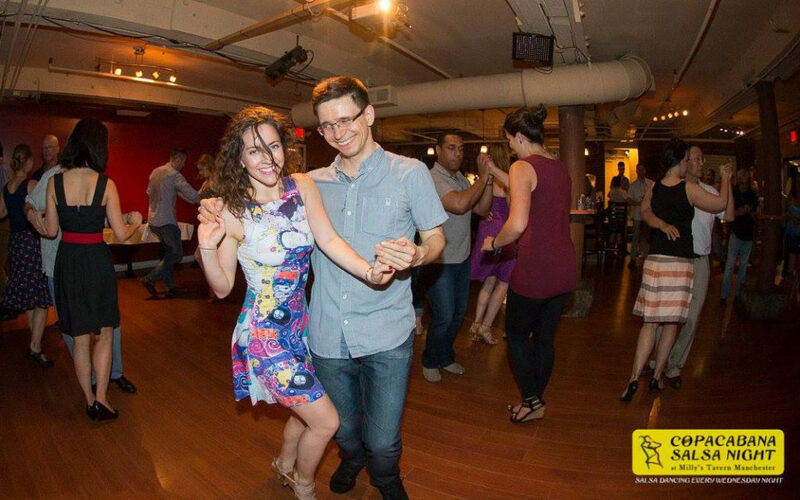 Get there early for our once a month special Bachata lesson with Susie and JR of Alma y Fuerza tonight. Bachata lesson starts at 6:45pm. Salsa Starts at the usual time, 7:45pm. Social dancing starts after the lessons at 9pm. Always friendly, always welcoming we hope to see you on the dance floor tonight! TONIGHT! 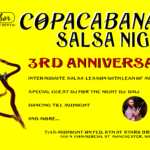 We celebrate three years of Copacabana Salsa Night! 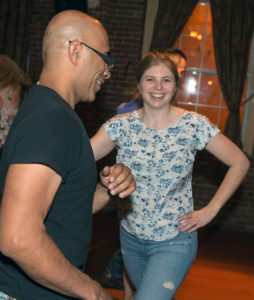 That mean’s our once a month bonus Bachata Lesson tonight before the weekly Salsa Lesson. 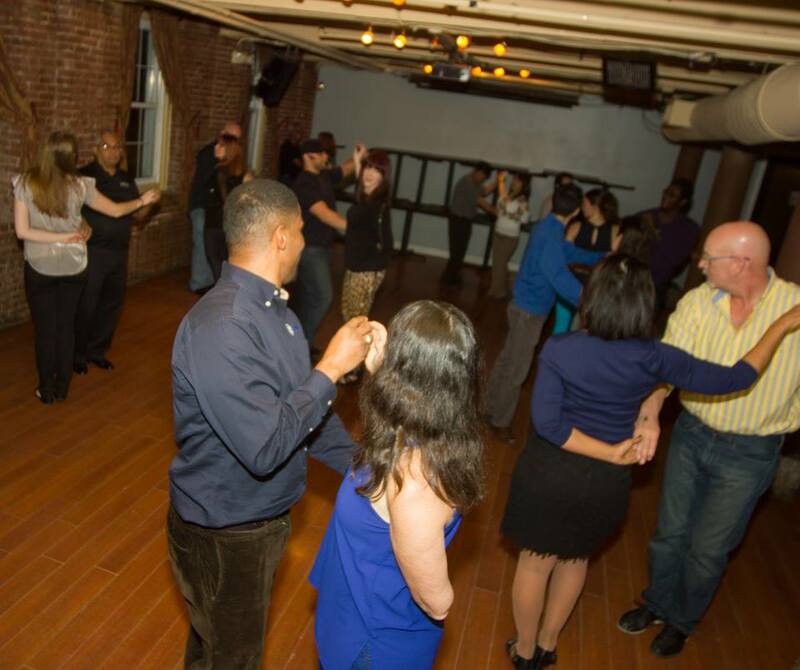 Bachata Lesson starts at 6:45pm and costs $10. 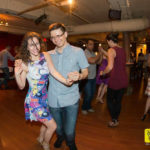 Weekly Salsa Lessons Start at 7:45pm. Social dancing starts after the lessons at 9ish and goes till close at 11pm. 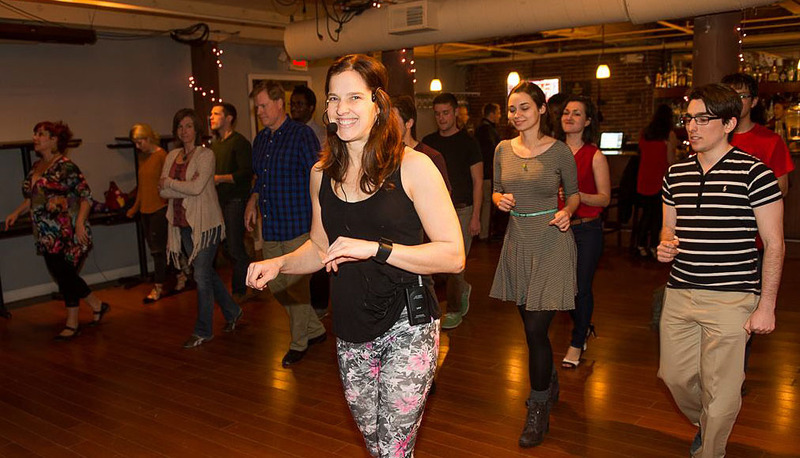 You only get to learn new bachata moves with us one week a month. Don’t miss it! 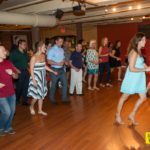 Have fun dancing in a fun, friendly, welcoming community at Copacabana Salsa Wednesdays. 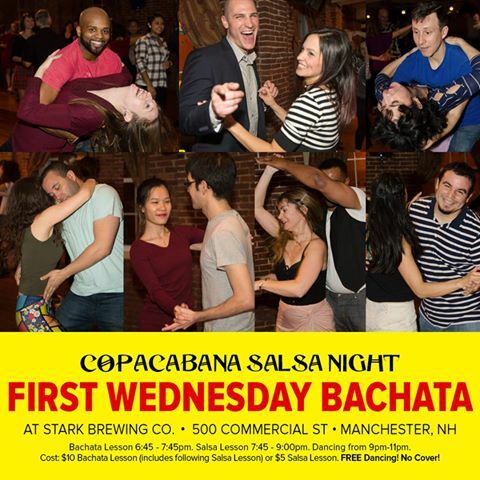 Copacabana Salsa Night is held at Stark Brewing Company, 500 Commercial St. Manchester, NH every Wednesday night from 7:45-11pm. 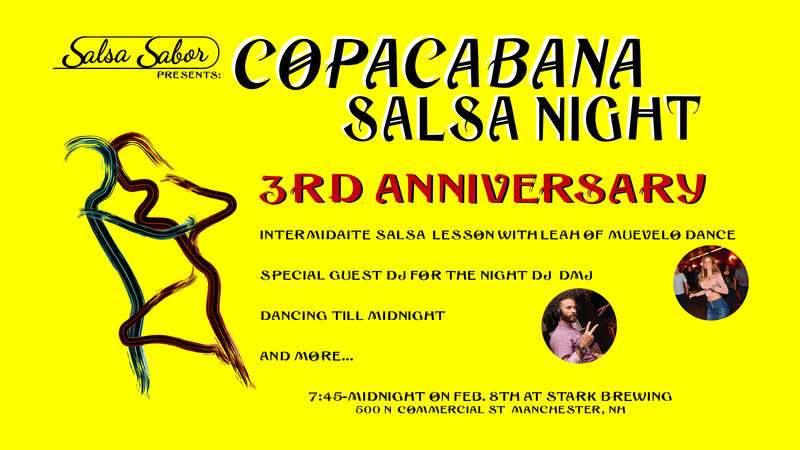 Three years of Copacabana Salsa Night will be celebrated on February 8th, 2017. 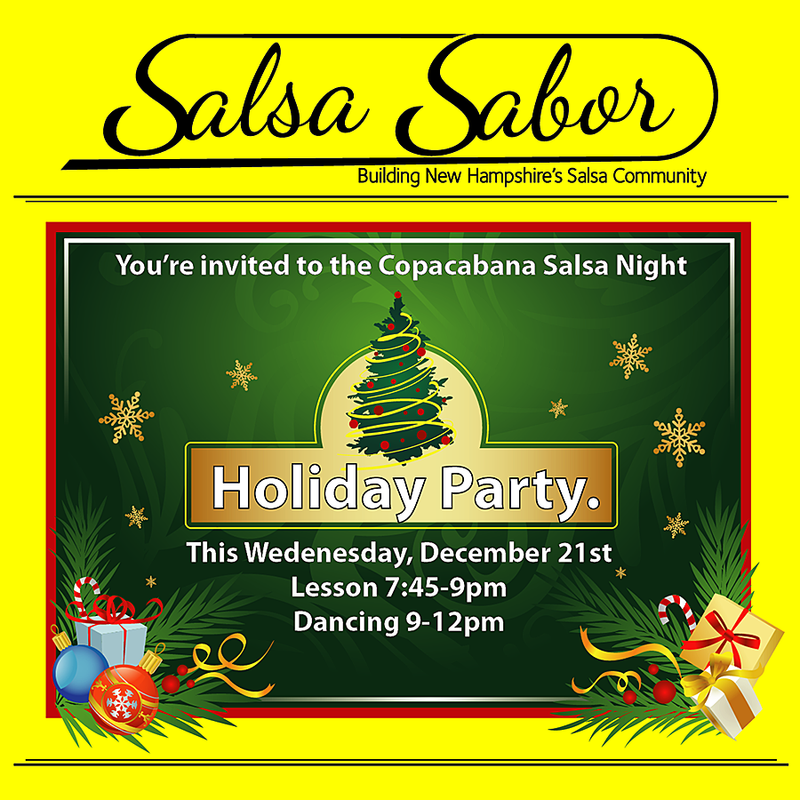 Please join us to celebrate the growth of our community and the sharing fun of Salsa dancing with New Hampshire! The intermediate lesson will be a special workshop taught by Leah Calitri of Muevelo Dance Studio and founder of Leah’s Chicas. 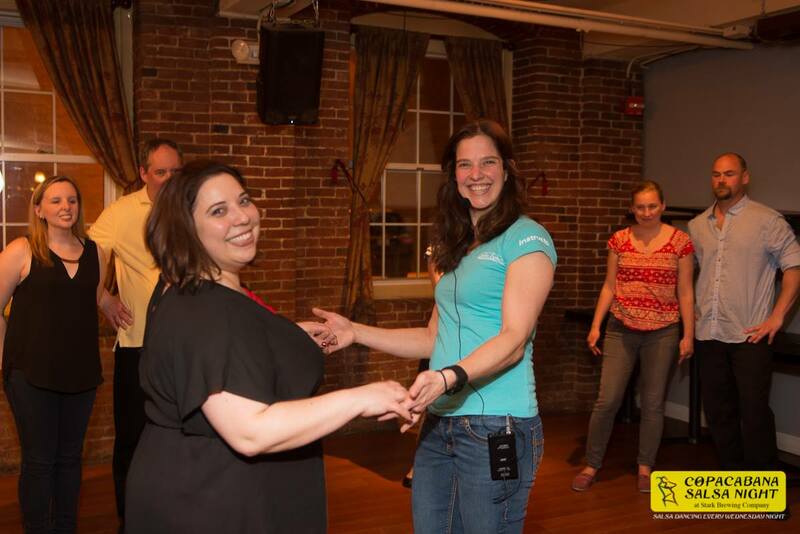 Many of the lovely ladies in our community have been a part of Manchester’s own group of Leah’s Chicas now with Salsa Sabor’s own Susie leading this fun ladies’ styling team. The lessons will be split into two rooms, with the main dance floor hosting this special workshop with Leah. Cost is still just $5 for the lessons, and beginner lessons will be taught in the middle room by Salsa Sabor. Dancing until midnight to the tunes of special guest DJ DMJ who will be playing the very best music for our dancing pleasure. Stay tuned, there will be much more to come as we solidify plans for this special occasion. It is our heartfelt hope that you will all come out dancing on this special night with us.